The top part of the semicircle bears the inscription “PRIMERA RESERVA NACIONAL FORESTAL” while the centre of the coin depicts a pine tree. On the left appears the Pesos symbol “$” and then “10”, and to the right, the number “2006”. 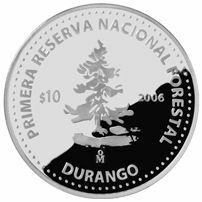 The mintmark of the Mexican Mintage is in the lower field and underneath it, the name of the state, “DURANGO”, appears in a semi-circle. The perimeter of the coin is surrounded by beading.